There’s no denying that buying a new central heating boiler can prove to be very expensive – especially if it’s a purchase you hadn’t bargained for! Regardless of your reasons for buying a new boiler, you’ll find that as specialists in boiler installations in Halifax, we have the expertise and industry knowledge to help you find the perfect boiler to suit both your budget and home. There are a number of different types of boiler available and the best boiler for you will depend on the size of your home and the kind of lifestyle that you and your family lead. The UK’s best selling boilers are combi boilers: offering efficiency and a compact, easy to house size, these boilers cover the heating and hot water requirements of most households. However combi boilers are most suitable for smaller homes where there is very limited roof space. System boilers are similar to conventional boilers but because they don’t have an expansion or feed system, system boilers offer the capability to heat a central heating system quickly. If your home has low water pressure and more than one bathroom, you’ll find that a system boiler offers the most economical option. As specialists in boiler installations in Halifax, at Tuke Heating we’re happy to offer free, no-obligation quotes and advice on the best boiler for your home. Alongside our boiler installation services, you’ll find that we also offer a range of boiler and central heating packages. 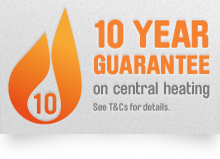 We’re confident that our bespoke boiler or central heating packages offer exceptional value for money and depending on your previous system, a new boiler installed by Tuke Heating could help you save up to 40% on your heating bills. We have any years of experience in carrying out boiler installations in Halifax and you’ll find that our service is professional and reliable at all times. Why not get in touch with us today? We’re happy to offer free, no-obligation quotes or advice at a time to suit you.